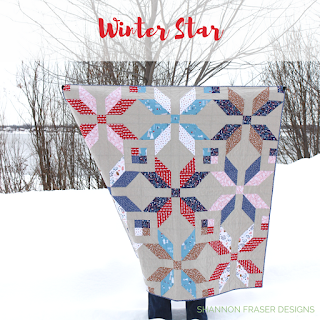 Shannon Fraser Designs: Irish Vortex Quilt Pattern - Fat Quarter Friendly! 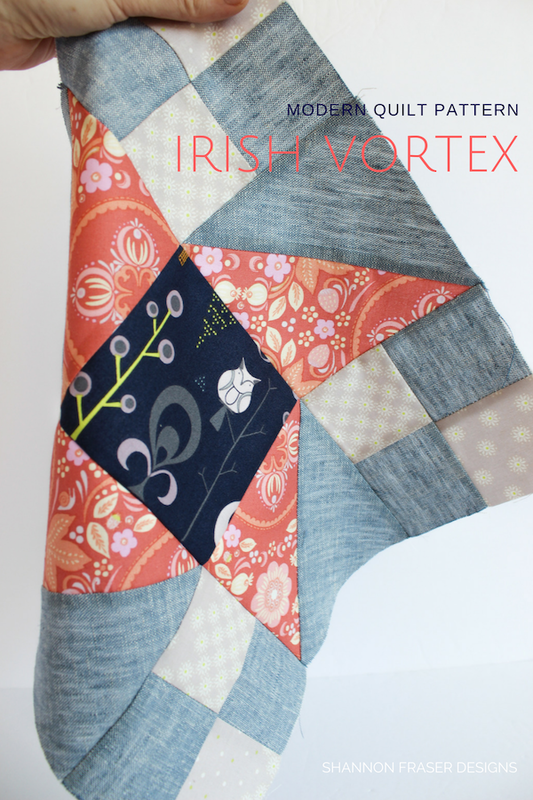 Irish Vortex Quilt Pattern - Fat Quarter Friendly! Have I got a fun pattern for you today! It can be scrappy. It can be colourful. It can even be Christmassy! In fact, I designed this pattern with Christmas in mind. So many quilt patterns that are designed with the holidays in mind tend to be very specific to that time. 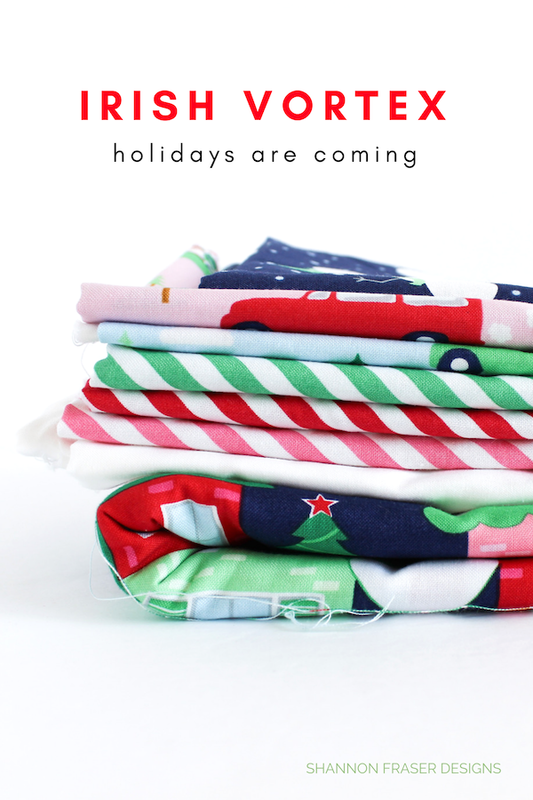 But I wanted to give you an option that would look amazing as a Christmas quilt (cause the holidays are coming...eek! ), but could still look great with any fabrics you have in your stash. This mash up of the ninja star with the classic Irish chain design just fit that bill perfectly! 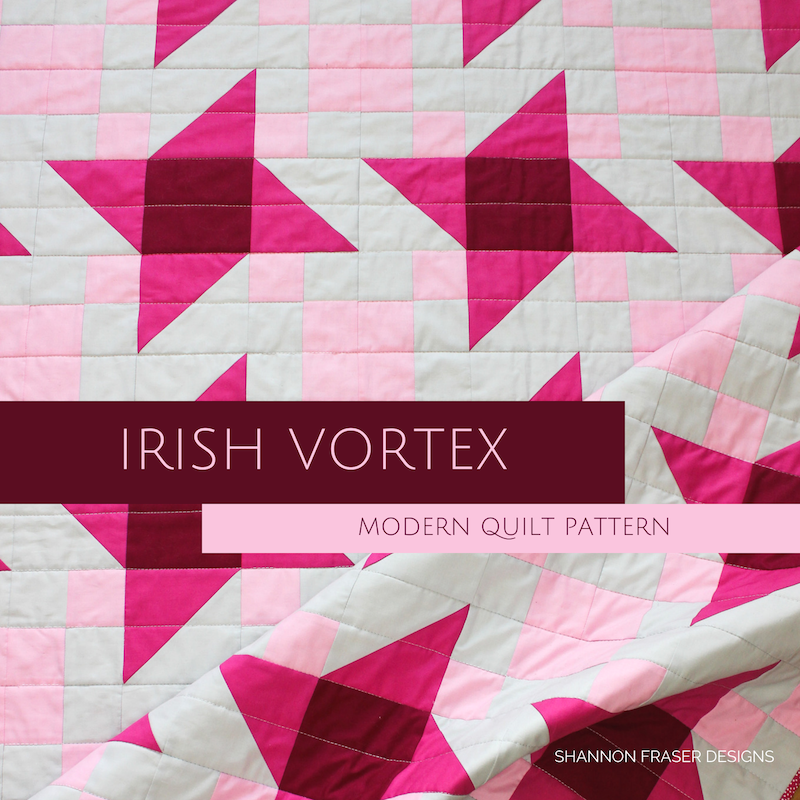 And the Irish Vortex quilt pattern was born! 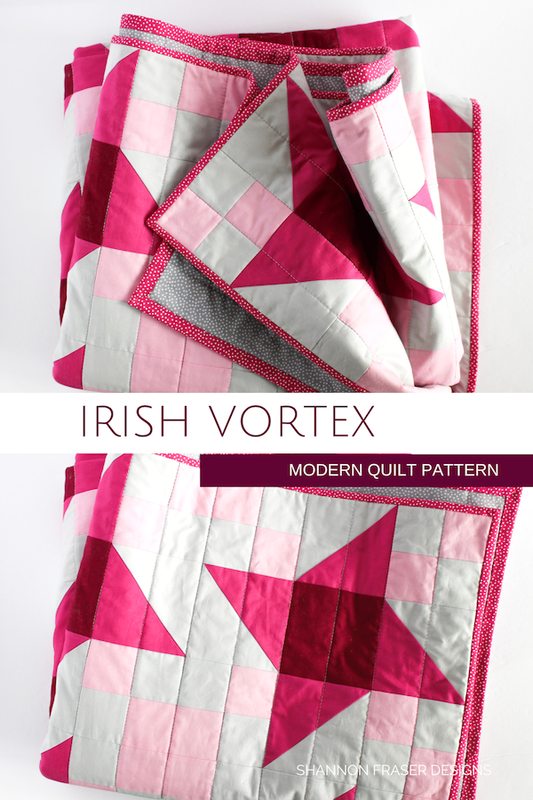 The Irish Vortex Quilt Pattern is now available - click here! This idea came about at a time when I was swamped with deadlines and secret sewing, but you know when you have an idea that you’re so excited about you just have to drop everything to give it a go? That’s what happened here. In less than a week, the pattern was designed, and the first version was a WIP. 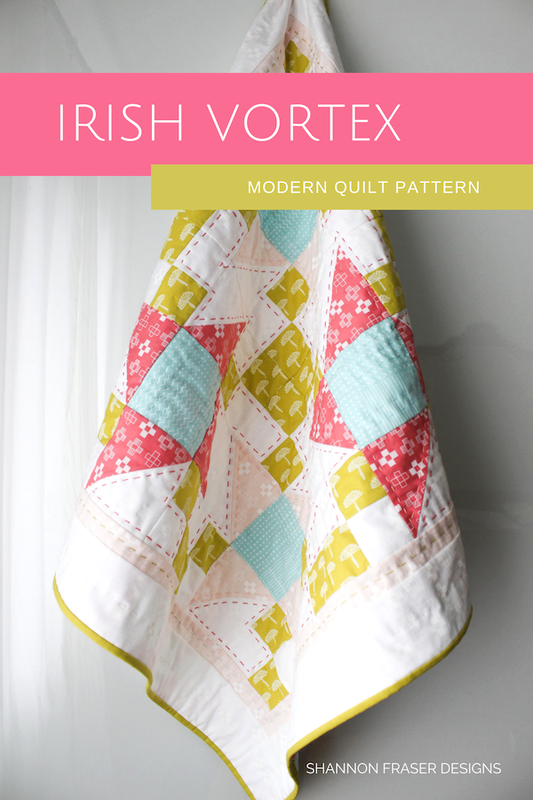 Let me show you just how fun and versatile the Irish Vortex quilt pattern really is. 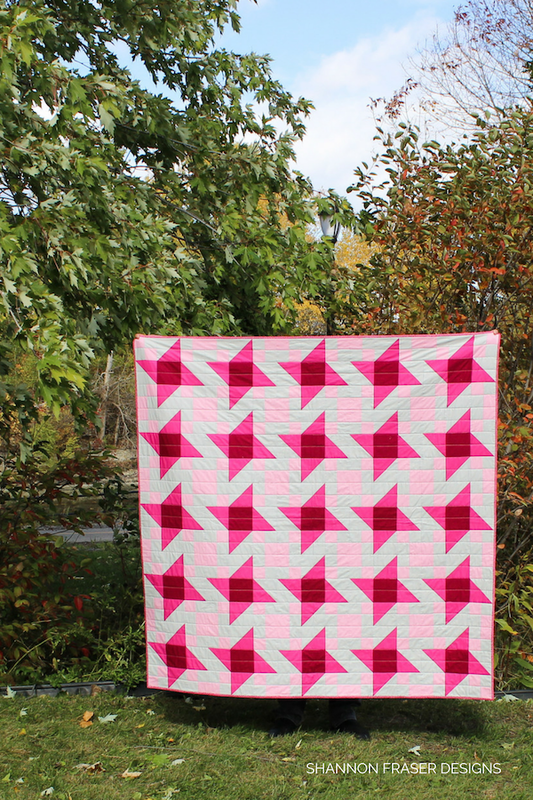 If you’re looking to try your hand at a solids only quilt, then check out this pinky gray version featuring these gorgeous Cotton Couture solids from Michael Miller Fabrics in the colours Pomegranate, Magenta, Pink, Nickel with the prettiest binding and backing in their Garden Pindot collection in Magenta and Nickel. The monochromatic colourway allows the design to really show the depth and movement of the pattern. There are so many directions you could go in with this approach and the pattern includes 8 different colourways to help spark some ideas! My go-to batting is always Quilter’s Dream cotton batting in either Request of Select. Here I’ve used Request in natural cotton. It has a beautiful drape and feel to it. Since I was crunched for time, I opted for some straight-line quilting in 28wt Aurifil Thread. This is my first time going with 2” wide spaced lines and the feel is quite yummy! It makes for a less heavy quilt, but is still perfect for snuggling. Baby/ Mini/ Wall Hanging 24"x24"
Step-by-step graphics so you know exactly how to piece the quilt top. Seam pressing chart to ensure your seams nest beautifully and results in nice sharp points! Cutting options for both yardage and fat quarter friendly versions. 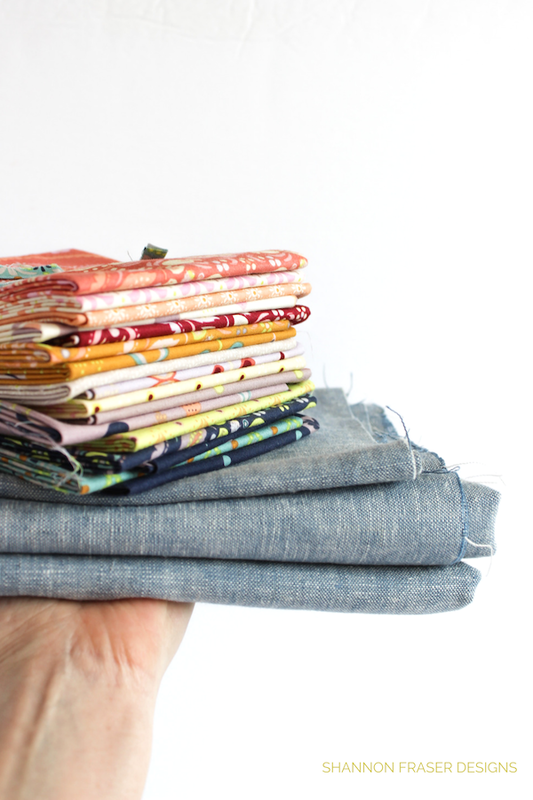 8 quilt design colourway mock-ups to help spark ideas and inspire your next quilt. A colouring page so you can plan out your own design ideas. 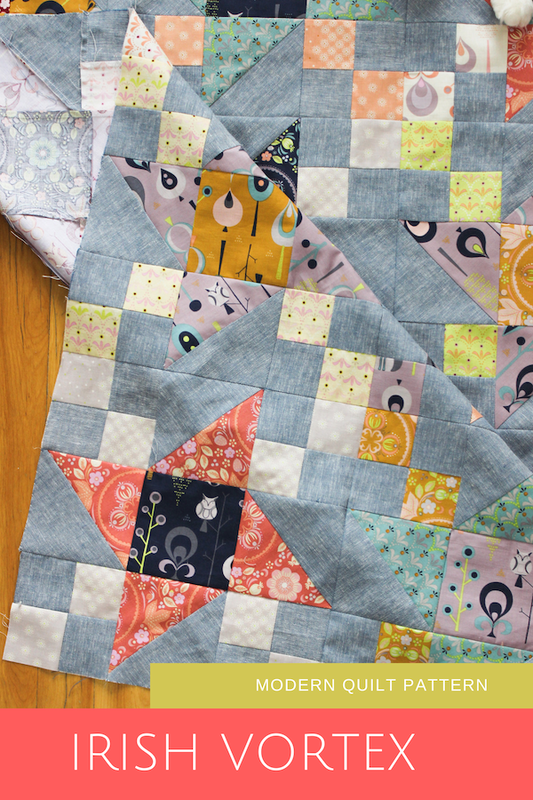 Hyperlinks to free quilt tutorials with additional tips for quilty success! 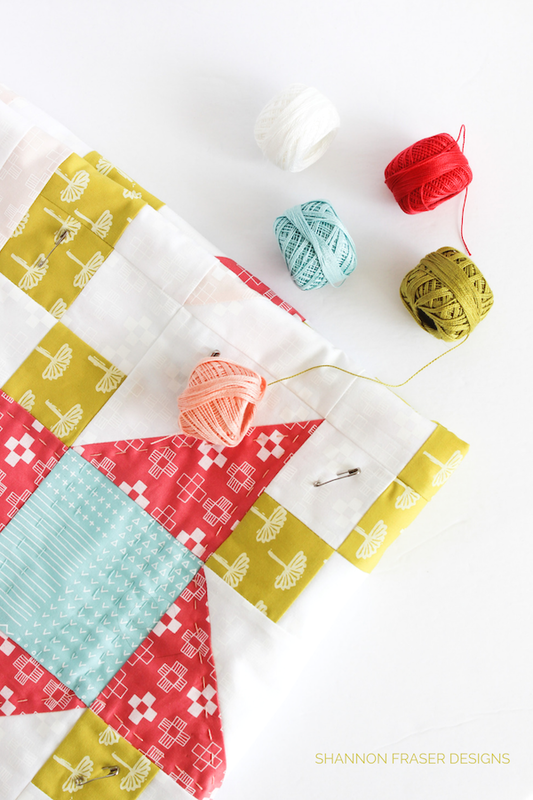 The first version I tackled was this bright and bold baby quilt using some Blueberry Park fabric scraps I had leftover from a secret sewing project. 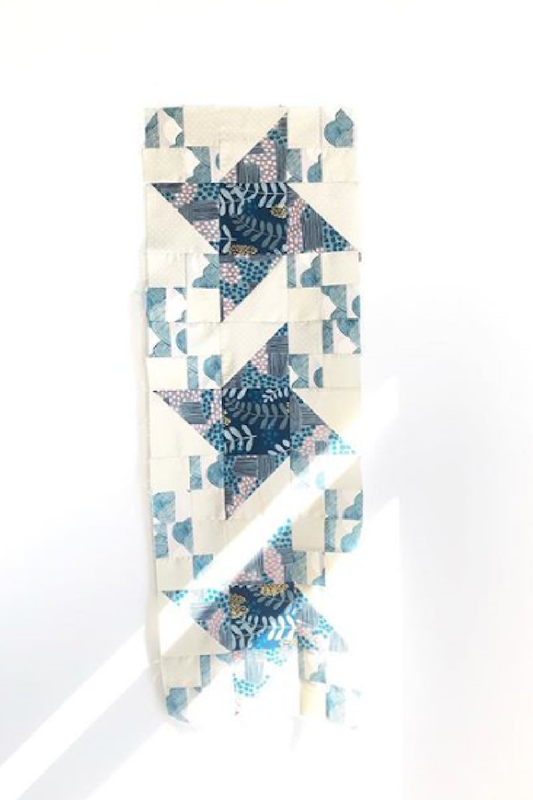 This one got hand quilted with pearl cotton thread to show you some possibilities with highlighting different elements of the quilt design. See those fuchsia stitches? I went bold and bright because I wanted to highlight the secondary pattern that emerges when you join the blocks together. 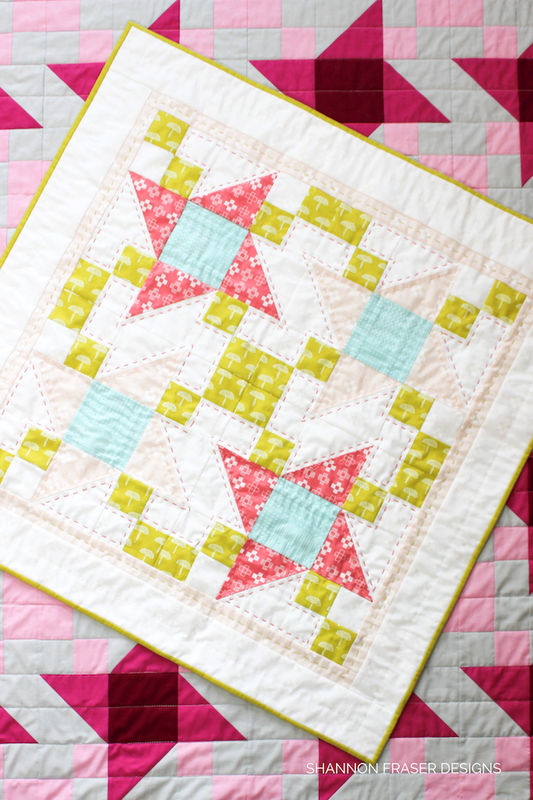 Lots of quilting options to play with here! Pearl cotton thread can be tough to find, so I’ve put together a list of resources for you here. 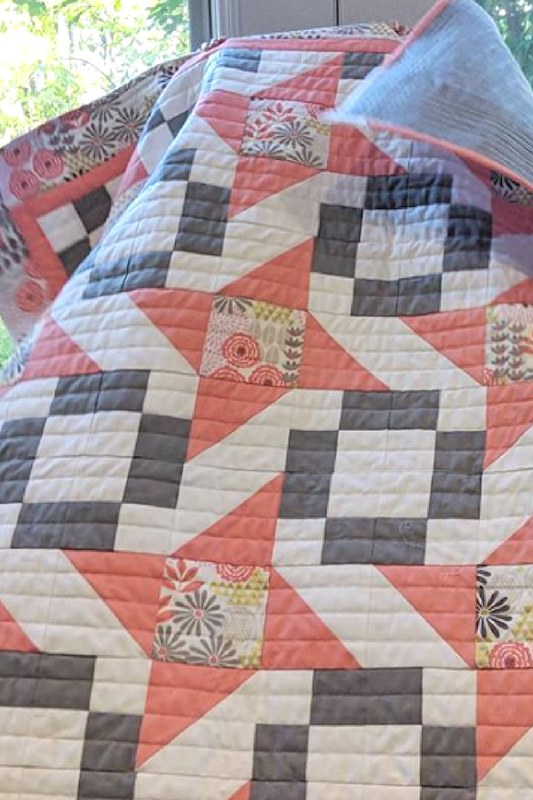 I even attempted my first big-stitch hand quilted binding – super cute, right?! Which I now have a tutorial in the works for you! Stay tuned for that coming your way soon! 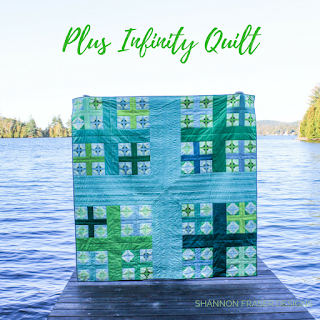 For all my scrappy quilt lovers and fat quarter bundle stockers, this Forest Fable version is for you! This fat quarter bundle, designed by Shauna Scicluna for Leutenegger (some yardage still available here) had been sitting in my fabric stash for quite awhile and I thought it was perfect for an autumn quilt. It got paired with this gorgeous Chambray Brussels WasherYarn Dye linen from Robert Kaufman, which added some nice cozy texture. The pattern also includes instructions specifically for using fat quarters. Gotta love a fat quarter friendly pattern! I’ve been loving seeing this ombré version in pinks and dusty yellows come together by Kenzie of YT Handcrafts. 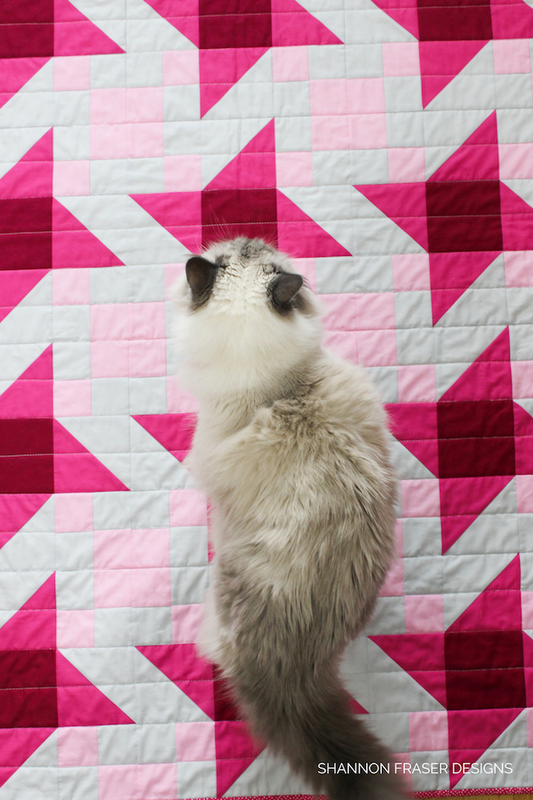 It’s totally making me want to snag an ombré fat quarter bundle and get cutting! 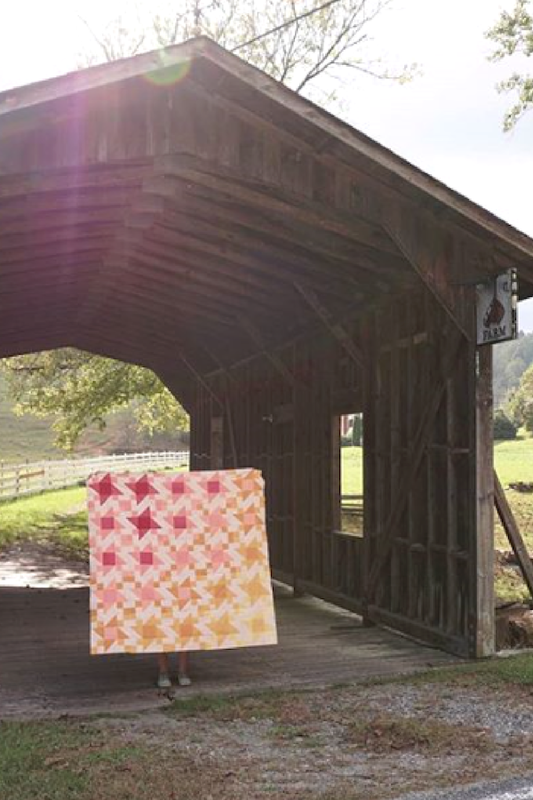 Flip is such an amazing quilter and knows how to pair fabrics! Just check out this orange, white and linen combo. Yummy! 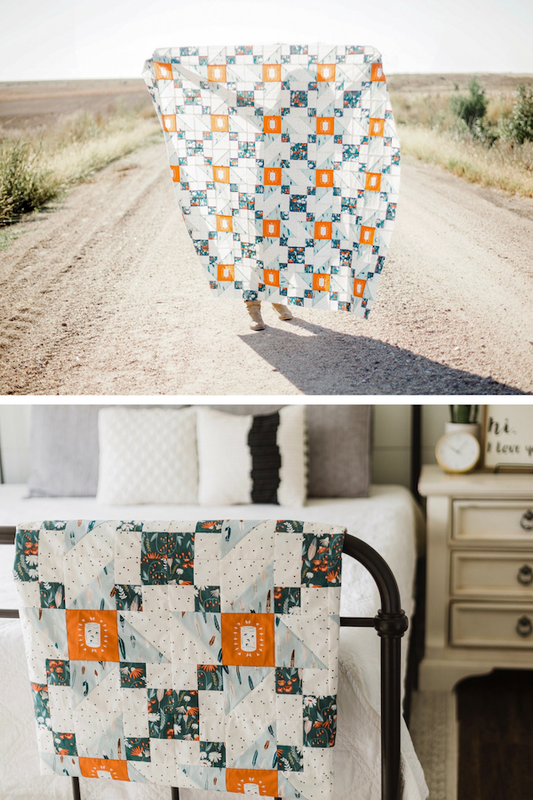 Ange of A Little Patchwork is working on a beautiful version featuring Cotton & Steel's Imagined Landscape fabric collection. The mix of florals and organic geometric prints is just stunning, and I can’t wait to see this one come together. You know my love for coral and seeing Frieda pair it with florals just takes it to the next level. 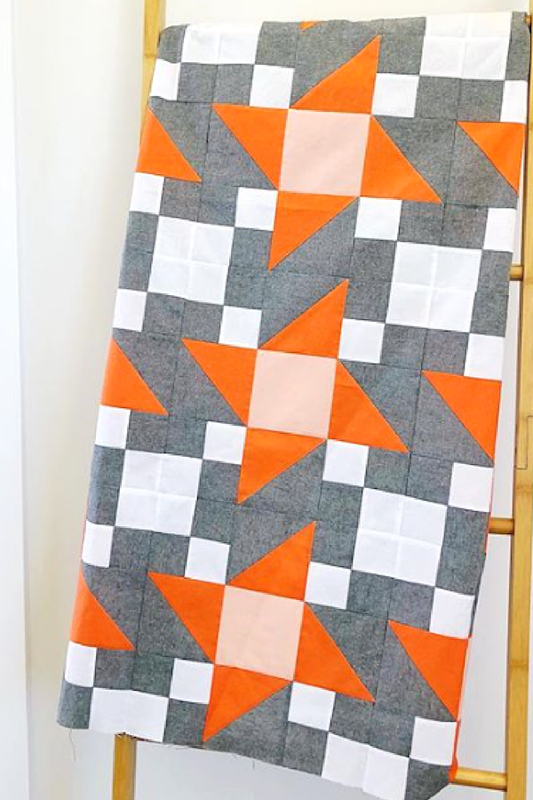 How fun is this orange and black themed version by Izzy of Dizzy Quilts Blog. 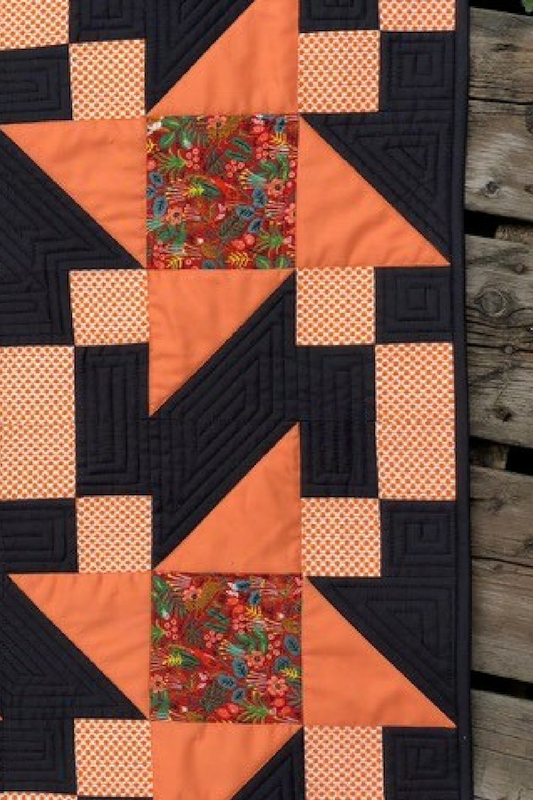 And did you catch the fun quilting she did in the black? Perfection! For more inspiration, be sure to check-out the #irishvortexquilt on Instagram! This pattern is so addictive, I’ve already got a Christmas themed version in the works featuring the Home for the Holidays collection from Michael Miller Fabrics. 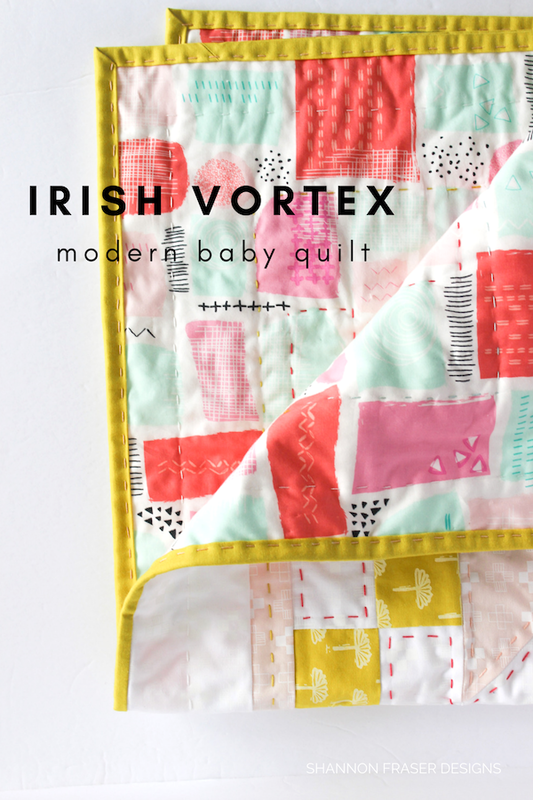 Not only does the Irish Vortex quilt pattern include a ton of different colourways to inspire you, but it also includes a colouring page so you can plot out ideas based on your favourite colours and prints. Even more fun than all the ways you can put your own spin on this pattern is just how quick it all comes together. 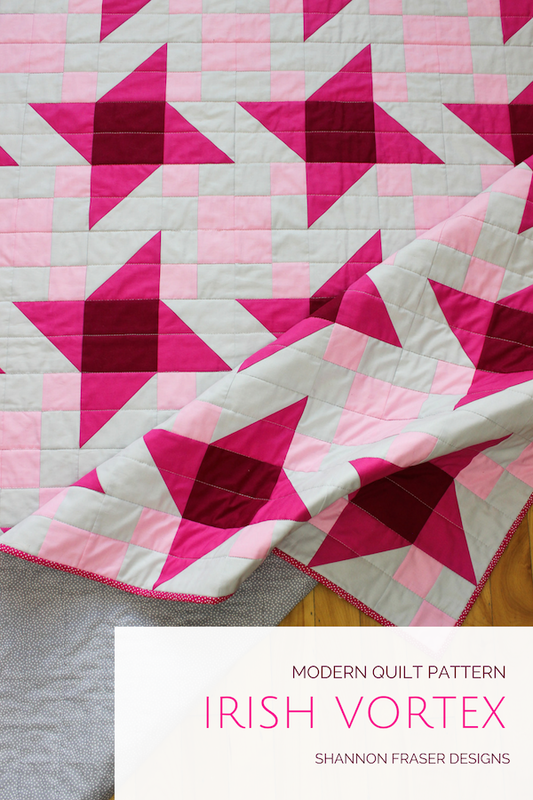 You can totally pull the quilt top together in a day or two, depending on which size you decide to make! She’s that fast to make. 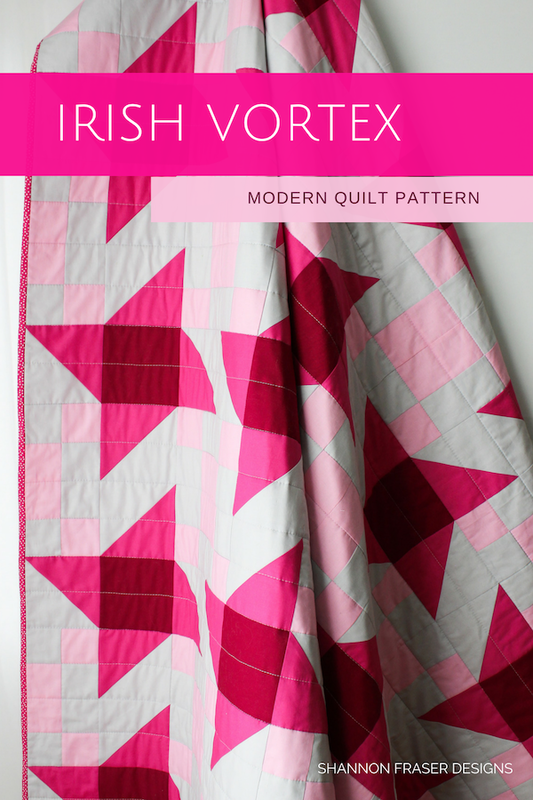 So, grab the Irish Vortex quilt pattern here and make your very own version today! I look forward to seeing the Christmas themed version you have in the works. Congratulations on your pattern release! Yay for the pattern release! I had so much fun testing this one for you and I love all the other versions here! What a lovely design, Shannon! So many options. I love this!